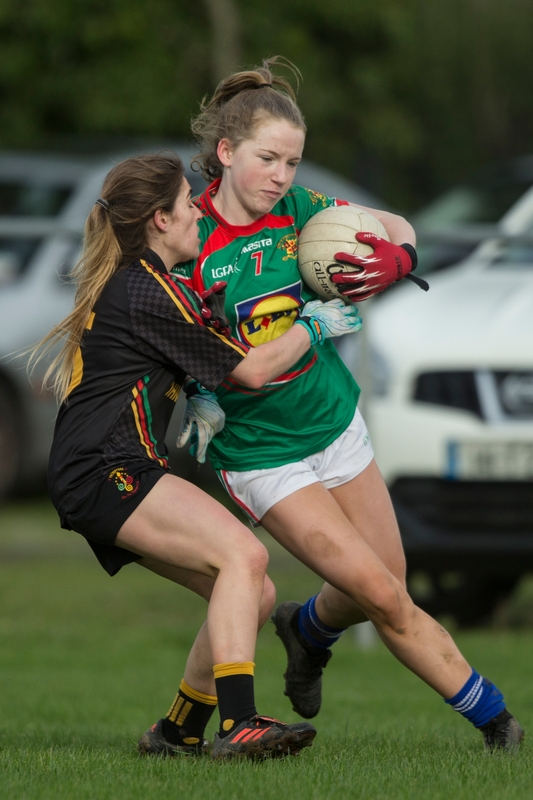 Holders Loreto Clonmel and John the Baptist Community School must do it all again after the teams played an exciting draw in the Munster Ladies Gaelic Football Post-Primary Schools Senior A Cup Final at Bansha today, Thursday. A draw was the fairest conclusion to a game of swaying fortunes, and the outcome of which hung in the balance until the final whistle. With players on both sides having run themselves to a standstill on an energy-sapping surface, they fully deserved another opportunity to win the provincial title. Loreto might feel hard done by, after they led for 48 minutes and let their six-points lead slip when they were overhauled by the Limerick team's powerful second-half surge. After they equalised, the Clonmel school also missed a couple of late chances to seal victory. But they will also be mindful of the 13 wides that John the Baptist School kicked, compared to just four for Loreto, while the Hospital school also had two goals disallowed. With supporters of both sides raising the roof with their chanting, accompanied by bodhrans and (in the Limerick team's case) a drum, there was a cracking atmosphere for a game played on one of the few really cold days of this winter. Loreto got off to a dream start when, straight from the throw-in, Kellyann Hogan, Orla Winston and captain Anna Carey strung a sequence of passes together and presented the opening for Saoirse Keating to score the opening goal. Anna Rose Kennedy opened the Hospital team's account from a free in the third minute, before their corner forward Ashling Ryan had a goal disallowed. However the Loreto's Hogan, Winston, Carey and Keating were soon at it again, once more combining to devastating effect before Keating was hauled down in the area. The penalty was duly dispatched to the net by Caoimhe Mulcahy in the eighth minute, and when Ava Fennessy added a point from a free the Loreto were six points ahead and flying. However the highly-rated Limerick side gradually gained a foothold in the contest. Anna Rose Kennedy converted a 12th minute penalty after captain Andrea O'Sullivan had been illegally impeded, and when Sinead McElliggott fired over a point two minutes later the deficit had been reduced to just two points, clear confirmation that John the Baptist school were right back in the game. The Hospital school enjoyed a prolonged spell of pressure without adding to their tally, and when Loreto eventually lifted the siege Ava Fennessy did the necessary from a free when Aine Fitzgerald was fouled. As Loreto continued to regain their composure, points from Eimear Quirke and Ava Fennessy (from another free) increased their lead. The Clonmel girls, who were much economical with their possession in front of the posts, ended the first half on a high when Kellyann Hogan slotted over a well-taken point in additional time. Andrea O'Sullivan replied with a point but the Loreto still had a healthy five-points cushion (2-5 to 1-3) at the midway stage. An Eimear Quirke point put them six ahead within as many minutes of the re-start, but Hospital soon seized firm control of proceedings. Anna Rose Kennedy, when she should have scored a goal, had a point in the 14th minute but Maeve Barry found the net a minute later to leave them just two points in arrears. Serious questions were now being asked of Loreto, who by this stage were finding it difficult to break out of their own half.The Clonmel goalkeeper Eimear McKeown, who minutes earlier had sprung from her line to avert a dangerous situation, then produced a marvellous save, her fingertips pushing Caitlin Kennedy's fierce drive crashing onto the crossbar and back into play. Hospital soon had a goal disallowed by referee John Murphy, following Anna Rose Kennedy's free. However their incessant pressure eventually took its toll on the overworked Loreto defence, Andrea O'Sullivan scoring the Limerick team's third goal. That score put them ahead for the first time with 12 minutes of normal time remaining. A point behind, a lesser team than Loreto would have crumbled. But the Clonmel side showed great character to respond at a time when the momentum had swung against them. With five minutes left on the clock Niamh Martin, Anna Carey, Veerle Van Der Wall and Ava Fennessy all had a hand in a move that ended with Carey's shot bouncing onto and then over the crossbar - what a time that was for the Clonmel captain to open her personal scoring account. The Clonmel side pressed hard in the closing stages and might have snatched victory, but neither side could have many complaints with the result. The Loreto might have conceded a slight physical advantage to their opponents but they more than matched them in terms of teamwork, determination and desire. While it was difficult to put some players ahead of others in what was a tremendous team performance, some deserve special mention. Midfielder Orla Winston was their greatest source of inspiration, a willing worker from start to finish who shipped a few heavy knocks for her troubles. Kellyann Hogan and Anna Carey helped out with that heavy workload, Carey playing a vital role in hauling her side off the floor in those closing stages after they had fallen behind on the scoreboard. Eimear Quirke, Aine Fitzgerald and Ava Fennessy were ever-present menaces in attack. Meanwhile, Brid McMaugh, Sadhbh Hallinan and the outstanding Niamh Martin gave everything for the cause in a defence that at times was required to soak up intense pressure. The Limerick team played their part in an enjoyable final, with Anna Rose Kennedy, Andrea O'Sullivan, Caitlin Kennedy, Maeve Barry and Chloe O'Dwyer to the fore. Friday, February 1 in Mallow has been suggested as a possible date and venue for the replay, although this has yet to be confirmed. Loreto Clonmel - Eimear McKeown, Sadhbh Hallinan, Veerle Van Der Wall, Gretta Nugent, Niamh Martin, Brigita Valuntaite, Brid McMaugh, Kellyann Hogan (0-1), Orla Winston, Aine Fitzgerald, Anna Carey (captain 0-1), Eimear Quirke (0-2), Caoimhe Mulcahy (1-0 penalty), Ava Fennessy (0-3 frees) and Saoirse Keating (1-0). Substitute - Ciara Ryan for Saoirse Keating (60 minutes). John the Baptist School Hospital - Ailish Kiely, Ciara Hynes, Emma English, Eva Butler, Maeve Barry (1-0), Chloe O'Dwyer, Lucy Ryan, Caitlin Kennedy, Andrea O'Sullivan (captain 1-1), Roisín O'Carroll, Emma Morrissey, Sinead McElliggott (0-1), Ashling Ryan, Anna Rose Kennedy (1-2, 1-0 penalty and 0-1 free) and Katie Heelan. Substitutes - Isabel O'Rourke for Roisín O'Carroll (41 minutes) and Sarah Jane Cooke for Sinead McElliggott (57 minutes).